When was the last time you paired your wine with your outfit? Some of you may do this with an innate sense of culture and style. Others? Not even close. Those who make a conscious effort are few and far between, but fashion and wine pairing is a more seamless match than you might think. 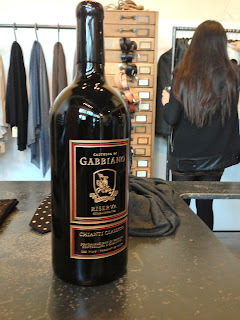 I was welcomed through the doors of Blackbird, a men’s fashion shop in Seattle’s Ballard neighborhood, with a crisp glass of Pinot Grigio crafted at the estates of Castello di Gabbiano. Winemaker, Federico Cerelli, jumped right into conversation, telling me about his run early that morning, the tour around the US that he would continue on over the next week, and of course, his lifestyle as a Tuscan winemaker. Small groups and individuals gathered in the shop for the debut of spring’s hottest looks—and a taste of the wines that go with them. Tailored men’s clothing, in primarily stony hues, hung neatly from racks along the walls. Scarves and ties sat rhythmically on wooden tables. The occasional magnum—decorated with the iconic knight on horseback—became a focal point among the neatly folded jeans and men’s fashion accessories. di Gabbiano’s historic winery, picturesque castle, and how he fell in love with Tuscany’s signature grape, Sangiovese. “It’s good, it’s good. Drink, drink!” Cerelli recalls his grandfather’s encouragement. He was just 9 years old at the time—his first glass of Sangiovese in hand. This was the crop of his family’s land, both respected and enjoyed on a daily basis for children and adults alike. The fashion of the evening took on a similar theme. 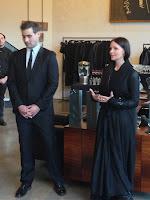 Outfits were styled for the young professional; that individual who is on the brink of his career and passionate about culture and the luxury of quality materials. Here exhibits the similarities and companionship of fashion and wine. Just like we dress for the occasion, we select wine for the occasion. Blackbird’s Creative Director, Nicole Miller, shares her tips for selecting outfits and wine for three different types of events that you might find yourself attending this spring. Take, for example, your backyard barbeque. Gabbiano’s fresh, fruity and dry Pinot Grigio is the perfect sipper for this afternoon affair. In struts Aaron, wearing Foss Tugger Chinos in fir, made from dense 100% Japanese cotton twill, a mahogany belt with a hand-cast buckle and a checked plaid top. Miller tops the outfit with a grey sweater tied on the shoulders for a fashionable and functional solution to Seattle’s chilly spring air. Now it’s Wednesday; your favorite wine bar awaits. What to swirl and wear? 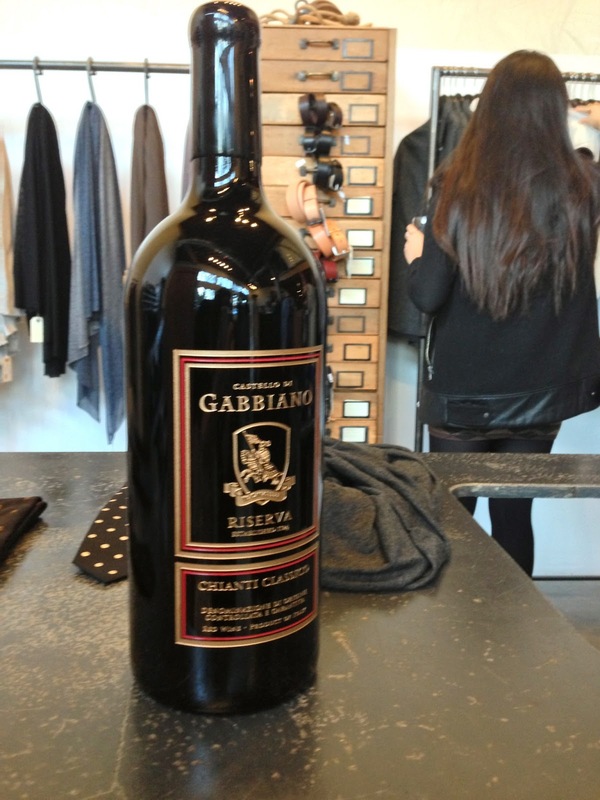 Fill your glass with Gabbiano’s Riserva Chianti. Ripe berry notes and a hint of cocoa will break up the week and take off the edge. Sipping this Sangio, you’ll want to look casually put together. Miller recommends a contrast collared shirt buttoned to the top, blue pants, and a one button notch jacket that is described to exude “humor, inventiveness, rebelliousness, and highly advanced tailoring.” What more you could ask from a Wednesday night? Finally, let’s talk formals. Some might argue that your choice of wine and fashion are most critically measured at an aristocratic event. In such cases, the reserve wines will do supremely. 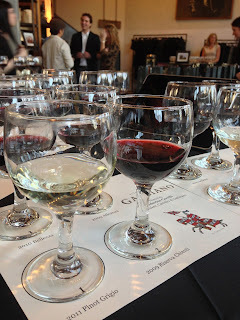 We were presented with two tastings for the upscale soirée: Bellezza DOCG and Alleanza IGT. Bellezza is 100% Sangiovese from the finest blocks on the estate vineyard. It displays a statuesque nose of ripe raspberry and berry notes complemented with French oak nuances. It was smooth in mouthfeel with silky tannins, bright acidity and a lasting elegant finish. Alleanza was crafted in the new world style. A blend of Merlot and Cabernet Sauvignon, this wine exhibited bold ripe fruit alongside notes of fresh basil and pepper. This wine is both complex and refined. 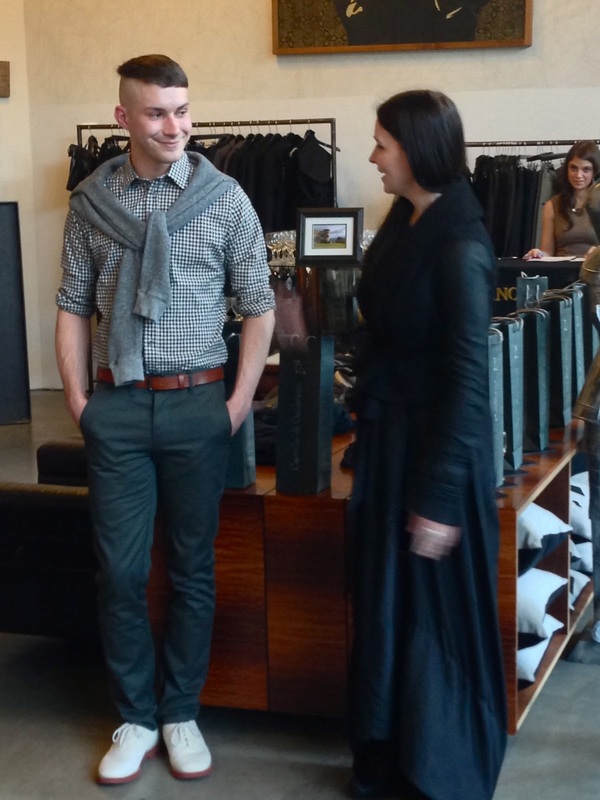 Layers, textures, tradition and impression, Gabbiano and Blackbird’s fashion and wine pairing event demonstrated that fashion and wine have long had a love affair. 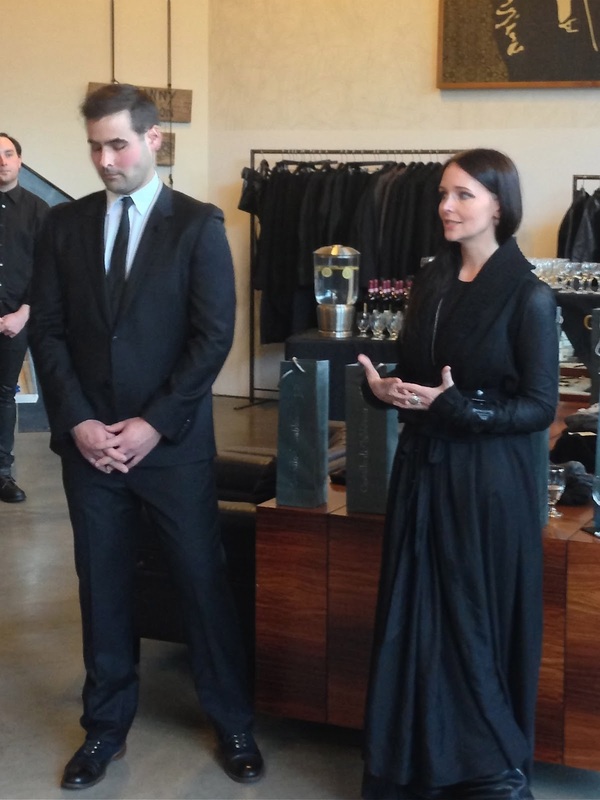 From barbeques to formal events, the two attend in tandem. 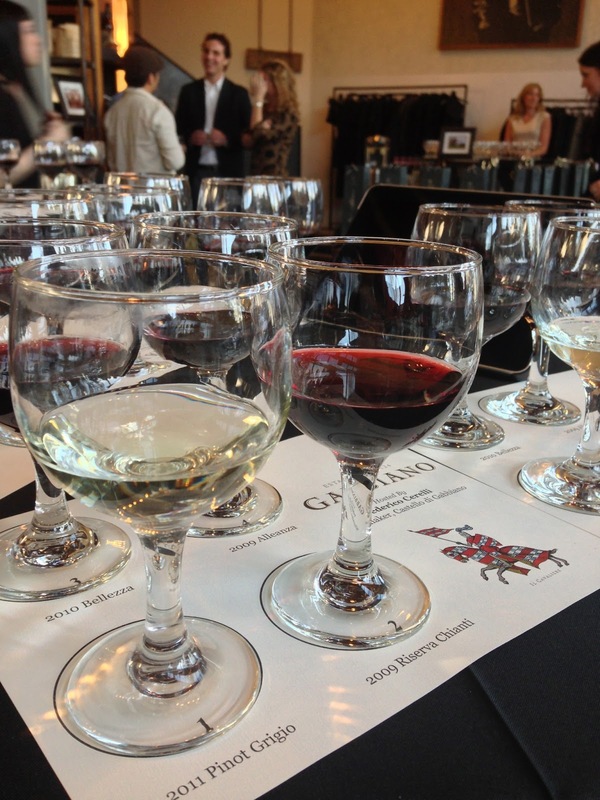 Do you have tips for selecting the right wine for the occasion? The right ensemble? Please do share! Nice to see clothing line for men. I wonder how expensive they would be! Bella clothing is my favorite to get in affordable price.